Yesterday, Apr. 5, I planted 1 of my 10 square-foot boxes (this particular box is 5′ x 4′; some others are 6′ x 4′). In Utah, it’s still cold, nothing’s turning green yet, and we’re 4 weeks off from the date we plan on the last spring freeze. I describe nutritional properties of, and advocate for planting, quite a few crops in the next chapter of 12 Steps to Whole Foods: Planting a Garden and Using Everything In It. Of those, you can plant 3 crops right now: CABBAGE SEEDLINGS, and LETTUCE and SPINACH from seeds. That’s what we did yesterday. Square-foot gardening (the book is by Mel Bartholomew) gets more produce per foot than any other method: 1 cabbage plant per foot, 4 heads of lettuce per foot, 9 spinach plants per foot, 16 beets or onions per foot. You can even build a grow box on a concrete patio (which I did on the TV show I went on). Next week, if you’re in a cold zone like us with a May 1 last-frost date, you can plant onion sets, radishes, beets, and chard. 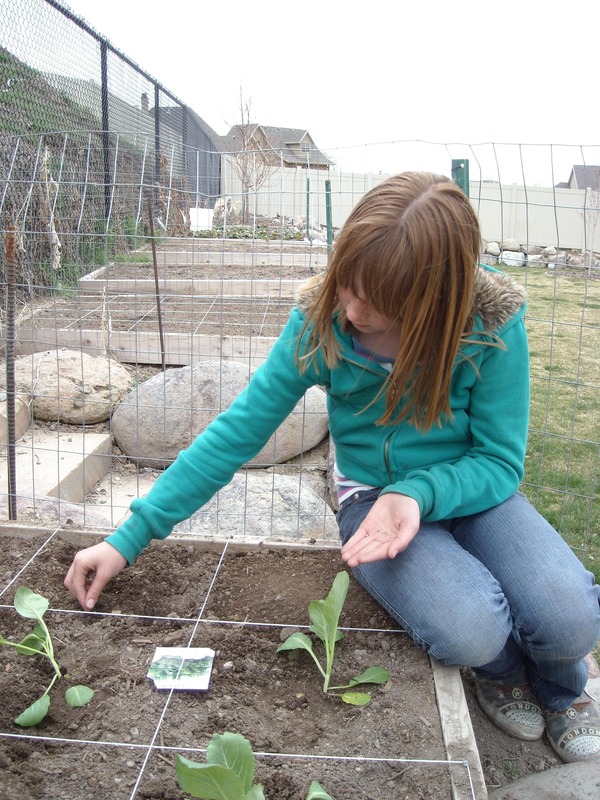 Involve your kids so they know where food comes from and so they have a sense of contribution to the meals that will result some weeks or months from now. I believe they also learn about the law of the harvest (you reap what you sow), and delay of gratification (work now for a reward later)—concepts that far too few modern children understand in the industrialized age of fast food and credit cards. A sound understanding of these principles lead to children who make better dietary choices, children who obtain education, and children who will teach your grandchildren self-sufficiency someday. It doesn’t get any better than that! Your tomato story is amusing, so many people miss out on what a home grown fresh tomato tastes like. We’ve been living in rental units with little to none backyard space. The past 4 summers we have successfully grown a few veggies in container pots. Enough for a few salads anyways. Ha ha This summer we will have a bit more space in the back yard and would like to build some square plots to grow even more produce. Thing is, we’d like to be able to take it with us when we are done renting. Are plots easy to build and then move? Any help would be greatly appreciated! Love your blog and website! Jaimie Oliver’s Food Revolution showed what children are eating in our schools. French fries and catsup count as vegetables. He showed a classroom of children fresh vegetables and fruit a piece at a time and asked what they were. They could not identify even the most basic of items. To not know what a tomato or peach looks like is sad. Rous Pienaar, Suite 84, Private Bag X34, Somerset West, 7129 South Africa. Have a splended spring and summer, and happy gardening. Diane, I don’t know. That would depend on your soil. But YES, it’s a very good idea to rotate different crops in your garden so they’re taking different nutrients from the soil. If you amend it with good compost, you might be okay–I don’t know (you can have soil tested at your county extension service but that’s a pain). Robyn, can all green leaves of garden plants be used for green smoothies? No, but many can. Strawberries, squash/zucchini, grape, those leaves I know are edible. Plus the greens from beets, turnips, radishes, etc., of course. It might be a good idea to research which green leaves we cannot or should not eat. I planted parsnips in my garden and thought I could throw them into my smoothies, but decided to check first and found out they were poisonous, according to the website I used. So now I would really like to know what NOT to consume.